And boy, do they rock! It's not often a design does exactly what you want it to do from the first try, but this time it worked. These blocks are the best upgrade I've ever given my poor old Ultimaker. Not only are they much easier to install than any bearing blocks I've previously had, they have amazing grip on the 6mm rods. My print head never felt this stable. Also, they actually provide a lot of tension by themselves, quite more than I expected. 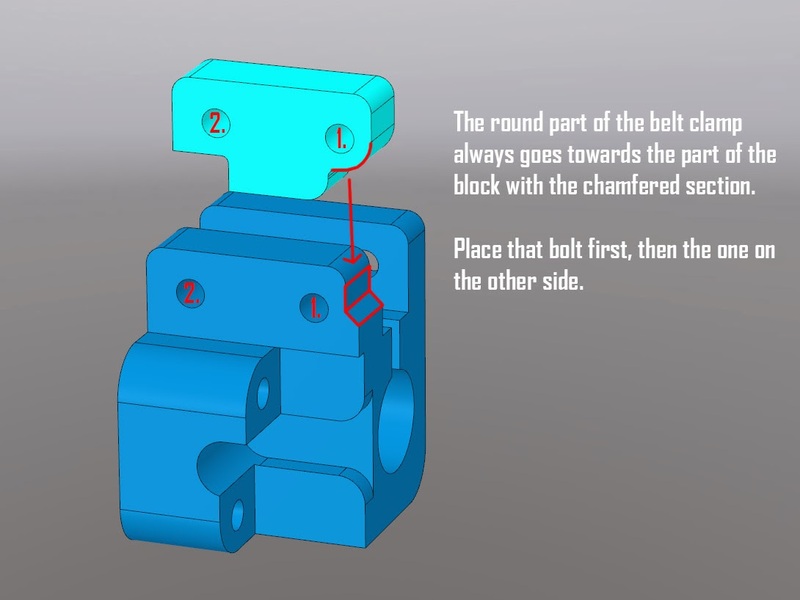 UPDATE 26.12.2013: The parts that engage the endstops have been widened to 10 mm to compensate for the blocks being 2mm wider towards the center of the printer, so that the default endswitch positions still work. All the files have been updated accordingly. 1. 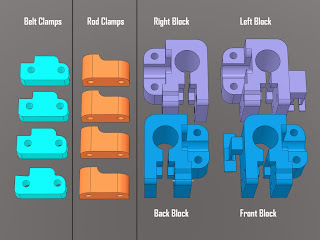 Download the files from YouMagine or Thingiverse. 2. Slice with 25% infill, double walls, 0.6 up/downskins or similar. No support. I used Cura for slicing. 4. 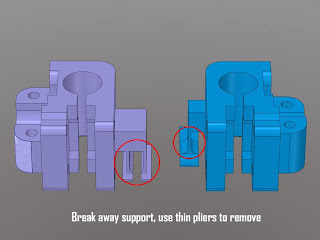 The Left and Front blocks have pre-modelled break-away support, use thin pliers to remove those parts after printing. Clean any blobs or strings left from printing. 5. Check if all the bores for M3 bolts allow them to slide in and out without much trouble, if necessary use a drill with a 3mm bit to carefully widen them. You want them to slide freely, that will save much time when (dis)assembling. 7. 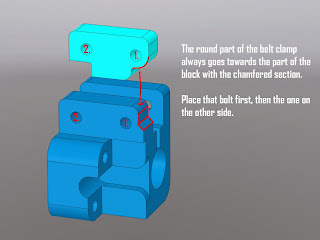 Slide a bushing into each TwisterBlock, and place two M3 nuts in the provided nut traps on each one. This will also keep the bushings in place. Be careful not to over tighten anything. The belts are kept in place even without it being very tight, you only need enough tension to keep the bushings in place, which is not a lot. 10. Now take your printhead with the 6mm rods going through it, and rotate it clockwise to slide all the rods into their positions. 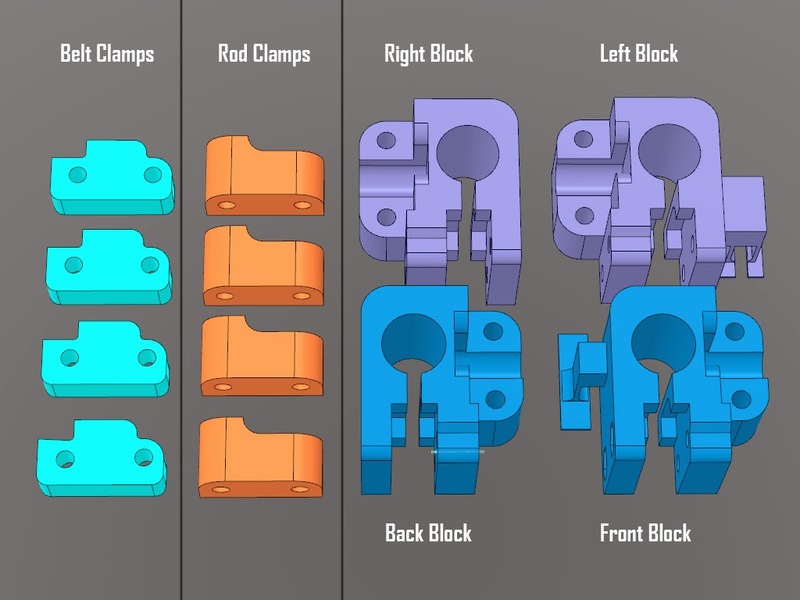 Take the rod clamps and bolt each one with two M3x30 bolts and M3 nuts.